There is finally snow in the mountains, so it's time to wax up the skis and head out. Here's Simplicity's description of this ski suit pattern. The hip-length jacket buttons snugly down the front. Gathers at shoulder yokes are smart and allow ample room for action. The sides are belted and there are two large convenient patch pockets. The long sleeves are roomy and gathered to a wristband. 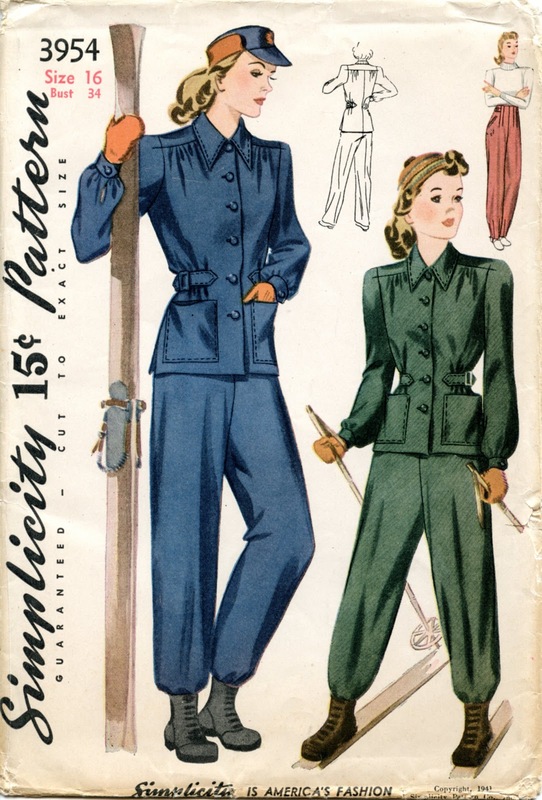 The trousers are dart-fitted at the top, close at the left side with a slide fastener, and finished with attached belts which buckle at the side. Welt pockets at front add a neat note. The description fails to mention that the legs of the trousers can either be pegged with darts, in which case slide fasteners are inserted, or left loose. An elastic band can be sewn in to keep the legs over the boots. Recommended fabrics include corduroy, waterproof poplin, gabardine, flannel, serge, novelty woolens. In this case, the flannel is assumed to be wool. Although the illustration shows only solids, you'd get a snappy effect by making the jacket in a plaid and the trousers in a solid to pick up a color in the plaid. Although the jacket is lined, you'll probably want to wear a heavy sweater under it. 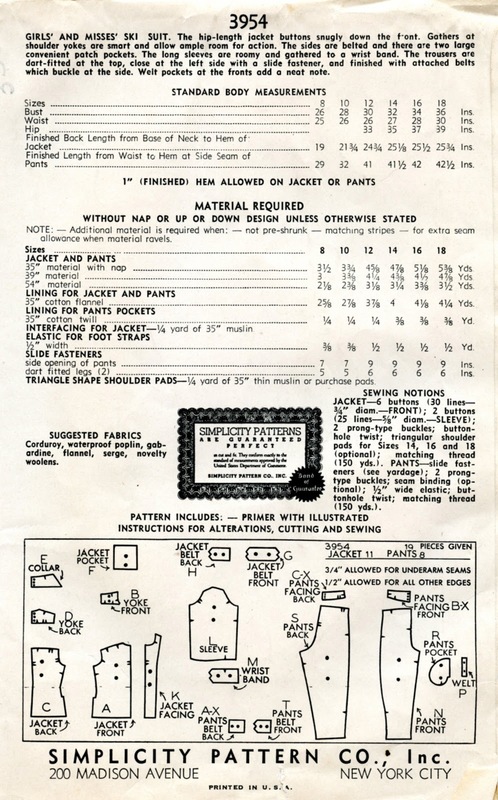 This unprinted pattern is unused. How structured our clothing was in the olden days. I assume woolen long underwear would be just right under the pants. ot those LL Bean long johns which are cotton next to the skin and wool on the outside. Toasty!